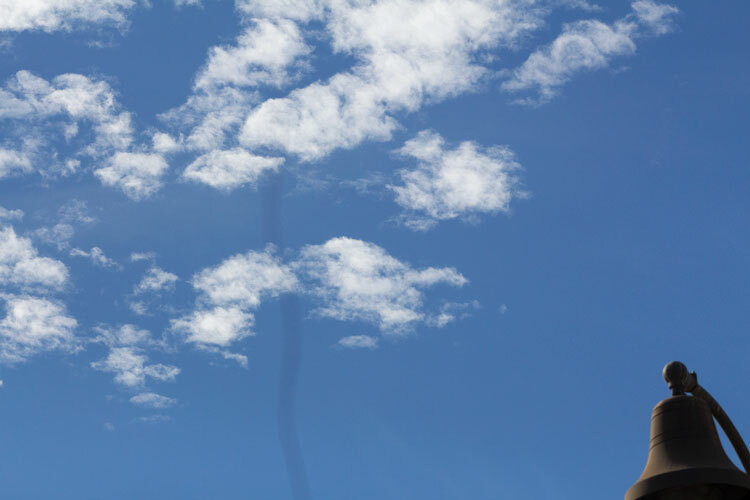 First, let's take a look at three different images taken as part of this sky/cloud analysis. This analysis can be tied directly back to a previous post concerned with scattering theory of light and why the sky is blue, etc. 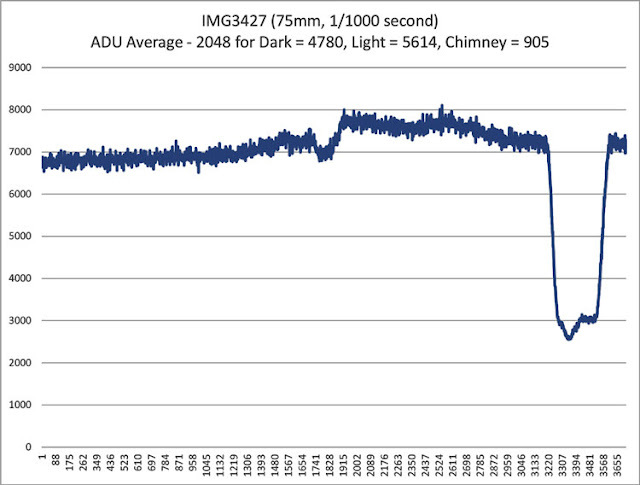 So, I didn't actually develop an observational plan, but just went outside and took a few photos that I thought would present an opportunity to do some light curve type analysis. Amateur astronomers know that in order to see dim objects like stars or nebulas and galaxies it is best to be in a dark sky site away from city light pollution. We normally go after objects that are brighter than the night sky, but during the daytime we can see objects that are both brighter and dimmer than the daytime sky. After all we can see in this image we can see the clouds, which are brighter and we can see the street lamp bell because it is darker than the sky. How much brighter or dimmer are the clouds and the bell in this case? 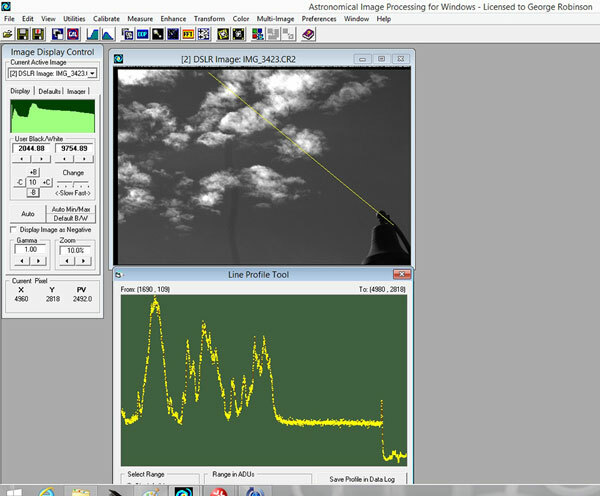 We can see in the AIP4WIN screenshot below what the average light intensity is across an arbitrary yellow profile line that goes across some clouds and daytime sky and the street lamp bell. 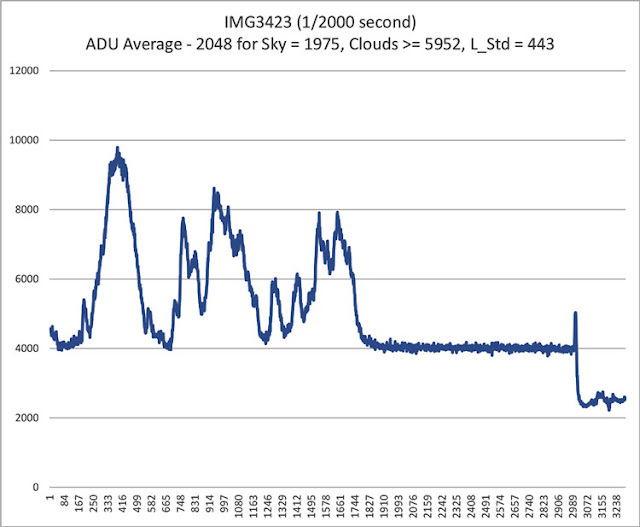 When we compare the actual camera pixel ADU values for these three locations we find the average intensity of light to be: Sky = 1975, Clouds =5952 and the light bell = 443. We can compare these different light intensities using the familiar magnitude scale, not to indicate actual magnitude, but to show the magnitude difference between these three objects. Using the daytime sky as the reference we can say that the clouds are 1.2 magnitude brighter than the sky and the street lamp bell is 1.6 magnitude dimmer than the sky. So normally we want to find object in the night sky that are brighter than the background. But you may be aware of one type of astronomical objects that is sought that you could say are actually darker than the background stars. No we are not considering a black hole, but readers can look up our comments on Bok Globules, which light the street lamp bell, get in the way of seeing any of the background stars. It is still not clear to me if amateur astronomers are able to see Bok Globules or if they are found too far away and too dim and are in the domain of the professionals? If you want to review previous posts on that subject refer back to the January 25 and May 26, 2017 posts that talked about that. One more set of images were taken during overcast daytime. The first image below shows the relative differences seen between light and dark clouds. These measurements were then compared to another image which shows how much light is reflected from the ground. Hmm, the difference between light colored clouds in this image and dark colored clouds is not really that big. The bright ones in this case are just on average 17% brighter. Now let's compare how much light reaches us from the clouds to how much light just reflects off the ground at the same location that the clouds were observed. 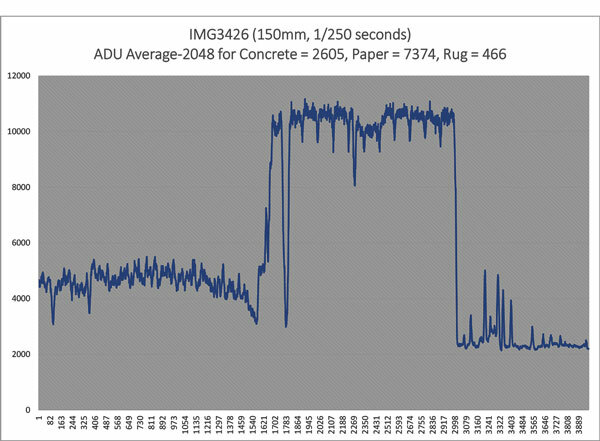 The arbitrary yellow profile line can be seen traversing some concrete, some white paper and finally a brown rug. This next screenshot shows the AIP$WIN profile line data imported into Excel and shows the average camera ADU across the three different materials. 5614 * (1000 / 250) / 7314 = 3.07 time brighter than the light reflecting of the paper on the ground. Three times brighter corresponds to 1.2 magnitude brighter. The light colored clouds in the second image were just a bit brighter than the dark colored clouds and this little bit corresponds to about 0.17 magnitude brighter. The difference between the clouds and the background sky in the first image is that the clouds are about 5952 / 1974 = 3 times brighter, which again is just 1.2 magnitude brighter. None of these cloud and sky images were part of a well thought out observation plan so many variables, such as relative sky position of the sun, and other effects has not been included in the analysis. This project was really just an exercise in taking images and doing some analysis while we wait for the clouds to go away. Well, instead of waiting for the clouds, this physicist wannabe will be in DC next week for the 231st meeting of the American Astronomical Society. Now that they off a reduced conference fee of only $50 it is hard to stay away, even though most of us have to pick up the airfare and hotel on our own. I look forward to hearing about all the latest advances and also hearing about the ongoing controversies. I try to follow the latest conjectures about integrating gravity and quantum entanglement and other such things. This time I will also pursue my growing interest in the programming language, Python, which is becoming the goto language for astronomical analysis. It turns out that Python is freely available and many of the data processing pipelines used for LIGO and other NASA projects is done in Python and these too are freely available. This makes it very easy for "citizen scientists" to download the pipelines and access the gigantic databases of publicly available data to perform their own analyses. I tried learning Python last year and gave up after being bored by the instructor, but now have started to come up to speed. I found some free online and low cost video tutorials, such as at www.udemy.com, and am now starting to create my own Jupyter notebooks. 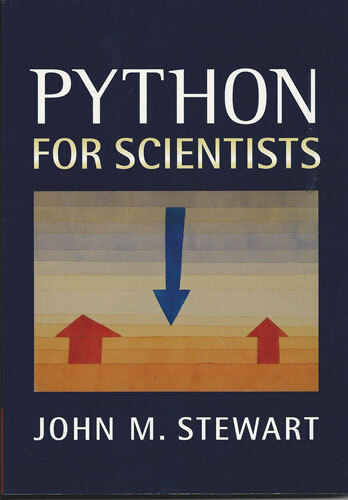 A good reference book on the scientific extensions available for Python is this book by John Stewart. A big part of astronomical analyses has to do with statistical interpretation and modelling of the data obtained by various telescope studies. Sampling data correctly and then extending the reach of the models predicted by just a tiny sample requires good statistical tools. For instance, you will recall all the interesting papers and findings that have come from the very long exposure of the Hubble Deep Field. The HDF has field of view of only about 2.6 x 2.6 arcminutes. Look at the following screenshot which shows the HDF with superimposed images of familiar astronomical objects, shown in the same apparent angular size. Note how big the edge of the moon is in comparison. 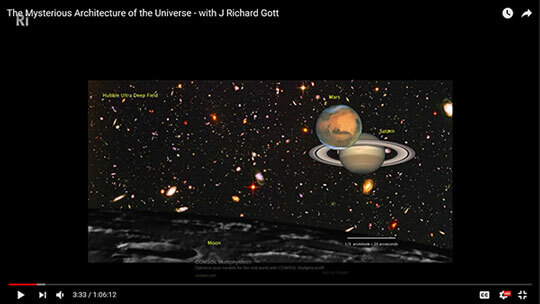 By the way, if you want an interesting perspective on the ongoing controversies in astronomy, check out any of the YouTube videos by Professor J Richard Gott. 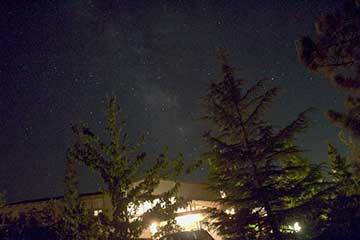 The HDF looks at a very tiny portion of the night sky and yet so much can be learned from this image. The leading statistical approach used now in astronomy and in much of ongoing science is based on Bayesian probability and statistics. One of the workshops I will be attending at the AAS will cover this topic. I had hoped to attend a workshop on an introduction to Python and how to download and analyze for yourself all of the publically available data, but those workshops were already full. 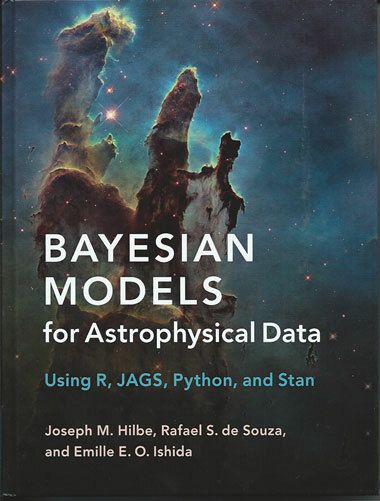 So for the Bayes statistics workshop, I am using the textbook shown below. This book is mostly over my head, but chapter 10 on astrophysical applications is really neat. I hope I can learn a lot at the workshop. My main worry is that I will be taking up a seat at the workshop that a real professional student, not a "senior student" like me, could be sitting and learning. Oh well, I'm interested in the topic too, so sign up earlier if you want a seat! 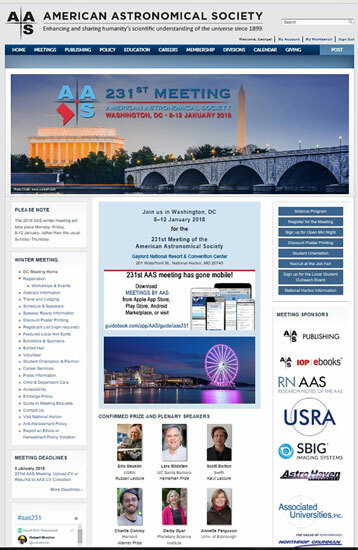 It is going to be really cold in DC next week, the forecast is for a low of 7 degrees, so I will be glad to stay inside and I might be able to post some comments about the AAS meeting.